Recently we were honored to have written a guest blog on Startups.co.uk, profiling how competitions & award placements have helped us grow. Read on to find out how these can help your business improve & evolve as well! If you're interested in winning some competitions yourself, take a look at our 2014 European/UK Startup Competition Guide and start applying. We've also got some top tips on how to win. Securing this funding round required achieving outstanding business results and getting buy-in from investors. As entrepreneurs, sales is one of the most challenging tasks and the most important skill to hone. We need to sell to customers, suppliers, partners, investors and team members. I believe that a successful sale, especially in the early days, requires two ingredients: network and reputation. While a network can be built through contacts, friends, business experience, and university background, reputation is sometimes tricky to build for a new business with a limited track record. As mentioned, reputation is built with track record, but you need a good reputation to gain some traction. So, how can a start-up solve this catch 22? No track record, hence no reputation, hence harder to sell and build a track record. The most obvious tool is to leverage the entrepreneur’s personal reputation, and another great tool is by getting media coverage, social proof and of course, winning start-up competitions. 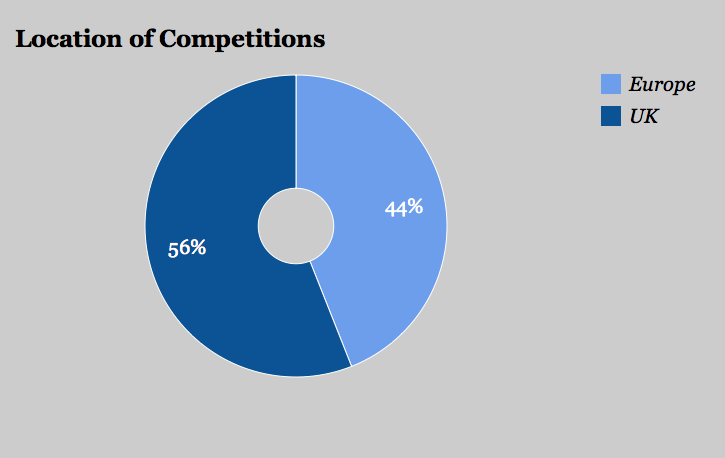 How do start-up competitions help build reputation? From a personal point of view, I feel that winning start-up competitions can really help build a brand’s status – it certainly really helped us to build FlatClub’s reputation. Being listed in the highly prestigious Startups 100 meant not only media coverage, exposure, and traffic to the site but it also offered an external validation which ultimately helped me secure a strategic partnership, and finalise the funding for FlatClub. After applying to almost 30 competitions, I realised that there is zero risk in applying. When I wasn’t selected as finalist, no one cared. And when I was selected it was a reason to celebrate. Hence, I started to look at applying to start-up competitions in a more structured way and have prepared some tips on the best way to tackle applications – and how to ensure you present your business in the best way possible. Well, the first step is to find them. I am glad to share with you the most updated version of theUK start-up competition guide my team and I built, which includes the largest database of start-up competitions, with over 60 and growing. It’s free to use and is a great starting point for finding out about the best opportunities to promote your business. You can’t win a competition if you don’t apply so it’s worth having at least one of your team members scouting relevant websites/publications for free or low-cost PR opportunities. Some competitions are only available to early stage/late stage ventures, to social entrepreneurs, or they’re sector specific. In our competition index we’ve created an option to filter the list to your specifications. There’s no point wasting time on an application that can’t even be considered. It’s probably worth spending a good few hours on the first application. The rest will be similar, so if you prepare one good pitch – you can just change it slightly and use the core pitch over and over again. This should be based on your one-page business plan. Finally, it’s easy to miss a deadline – but don’t. Make a note in your calendar of key dates you don’t want to miss and be disciplined about sticking to them. Although filling in an application can seem like precious time you can’t spare the benefits of a win will definitely make the time worthwhile – and if you don’t win, you’ll have a good basis for entering other competitions more swiftly. Winning start-up competitions is of course just one step in building a business. Without solid growth, clear differentiators, talent, a motivated team, and an outstanding marketing plan, it’s not possible to succeed and raise funding. However, external endorsement not only offers a great boost for your team but it really can be the tipping edge for you and your business, just as it has been for FlatClub. This time on Host Question Time, Girish, a full time host on FlatClub, sat down to tell us a little bit about his story. How did you get started as a host? Well, I was working as a consultant, traveling frequently and staying in a lot of hotels. I personally enjoy traveling a lot. Traveling for leisure is the best, but I even enjoyed traveling for work. I did not however enjoy spending a lot of time in hotels, I really don't feel like it's the best way to spend time in a great city. So your idea was to provide an alternative for traveling consultants? Exactly, consultants or any other type of business travellers, or any type of visitor really. I saw an opportunity to provide a different type of experience for people. It's been great. The fun side of full time hosting is meeting a variety of people. I try to personally greet everyone who stays in my flats to make sure they're comfortable and doing well. How has your lifestyle changed from working as a consultant to hosting? In terms of hours sometimes it feels like not too much! Haha, but for me, it is a much more interesting activity. You meet a lot of people and each guests stay, whether good or bad, is never the same. Well, I helped a man sneak flowers into the flat for his girlfriend once! What happened was the flower delivery guy came at the wrong time. The girl had already returned. So, the guest called me for help and under the guise of "maintenance issues", I, and the flower delivery man snuck into the kitchen while he occupied her in the living room. It was good fun. They are 2 of my favourites! 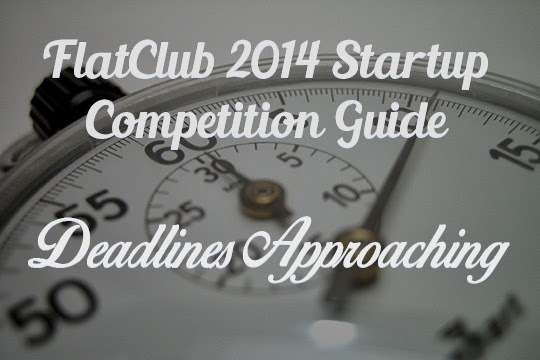 Our 2014 Startup Competition Guide has really taken off thanks to some great submissions from our community. There are a few competitions that are ending soon, so make sure to get your entries in early for the following 3. Venture Cup Startup CompetitionThere must be at least one student, staff or graduate from any Danish University on your team, but if you meet that criteria your business plan may net you £28k! Submit soon, as the deadline is April 29th. Are you a country-based entrepreneur? Enter the My Country Business competition through the online application form, and win some one of a kind advice & experiences! Get your form drafted soon though, as the deadline is May 9th. If you think you have the answer to the question: "How can we use technology to address the world's greatest financial challenges and impact the lives of millions in just three to five years? ", then you've got to enter the London Grand Challenge! The prize is a a full scholarship placement at Singularity University's Graduate Studies Program, this summer in Silicon Valley. Read more for details, but get your application in before April 4th. Three competitions coming to a close soon, but there are plenty more where that came from. Glance through our interactive 2014 Competition Guide, and let us know about any contests we might've missed! The Links Here May be Out of Date! Our 3rd edition of The UK & Europe Startup Competition Guide is out! It is the biggest and most comprehensive database of UK & Europe Startup competitions around. In it you will find the competition criteria, awards, deadlines and a direct link to apply. Browse, choose and submit your application. There are over 50 initial opportunities to compete and more on the way. This year the guide has a great new format and it is fully interactive. Submit competitions to the database, play with the data and help us make it easier than ever for young startups to find every competition opportunity on the map. 1. Add any competition, Add your competition! We are hosting the database on Google Fusion Tables which lets you visualize the data set any way you'd like. Create graphs, charts and comparisons by clicking on the "+" tab on the top right. If you come up with a unique angle - email us! We'll make it a standard tab. Interested in staying on top of when each competition is happening? Sync to our EU/UK Startup Competition Calendar. We'll keep the deadlines up to date! FlatClub has competed in and won a fair share of startup competitions including TechCrunch's 1-sentence pitching competition, the JC Entrepreneurship Award and the AMBA Entrepreneurial Venture award. Check out Nitzan's advice on how to win startup competitions. Book office hours here. With your help we can build a definitive, exhaustive competition database for the startup community. Here's the short link - http://flt.cl/CompetitionGuide - Tweet, Post to Facebook & LinkedIn and let your startup networks know. 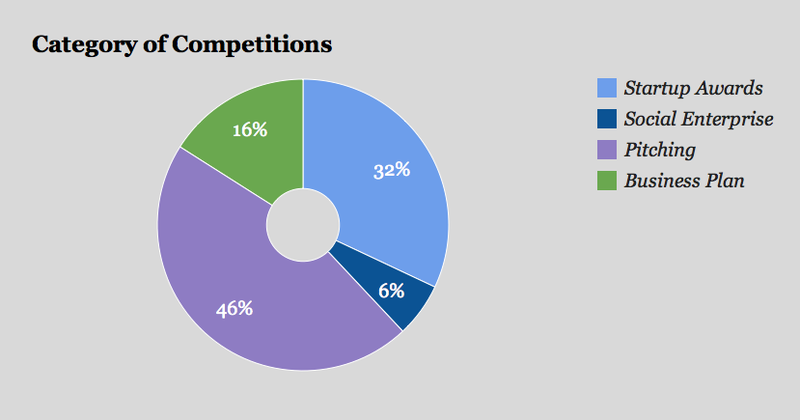 Here are some fun highlighted data from the competitions we've captured so far. You can make your own graphs and submit them to FlatClub! If you just want to take a quick glance, all the competitions we have captured so far are below ranked by deadline or click here to see the full guide. Target/Criteria: European-based companies in the market for K-12 education, B2B or B2C internet-related software services offered to schools, teachers, parents or children/students. Notes: Applicants must be able to base themselves in Southampton and hold the relevant documentation to work in the UK. We've had the opportunity to partner up & engage with some of the leading university's of the world: through their alumni, students, and faculty. Our clubs, well over 400 now on the site, are a testament to our value for university communities. About a year ago, we produced a PDF detailing our some of the stats & facts for our largest club: the London Business School Club. Read on for highlights, and below you'll find a link to download the full PDF. The LBS Club on FlatClub is 60% alumni, 26% current students, and 14% faculty & staff. In the first 2 years of the LBS Club's existence, more than 300 bookings were made within the club. Members of LBS Club who host on FlatClub have earned in excess of $250,000 - while members of the club who are guests have saved over $1.4 million on FlatClub. Those savings come largely from the fact that rooms & flats on our site are 78% less expensive than comparable hotels. University admins know that finding short term accommodation that is both affordable & trustworthy isn't always easy. FlatClub makes it simpler because we can vet the credentials of a host, and our properties are significantly cheaper than the other options. We must be doing something right, as 99.2% of our guests & hosts would recommend us to friends & family! Search for your club now, and download the below PDF for more information on how FlatClub helped LBS in 2013.